7 May 2013, SKA Headquarters, Jodrell Bank Observatory, UK – Less than a year after the decision to site the revolutionary Square Kilometre Array (SKA) in both Southern Africa and Australia, the SKA Organisation has opened its new international headquarters. In front of an invited audience of local and global dignitaries, scientists and engineers, the UK Minister for Universities and Science the Rt. Hon. 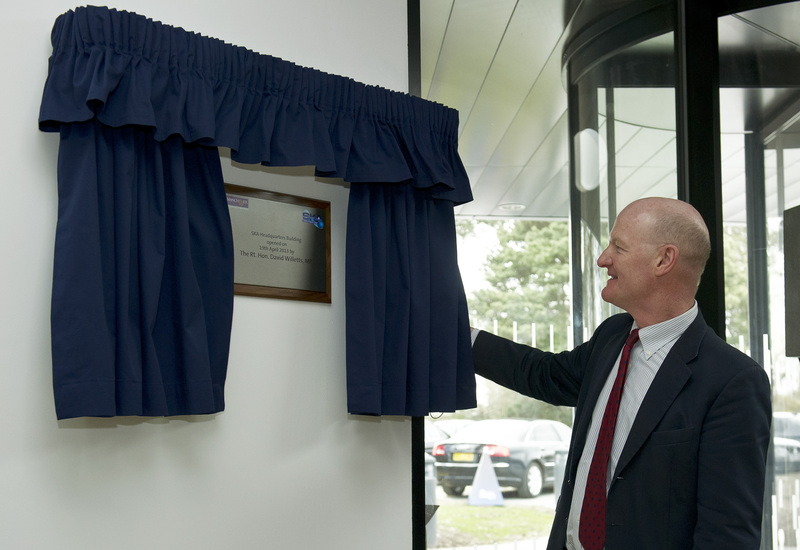 David Willetts MP recently opened the building which will be home to the team managing the construction, design and scientific output of this groundbreaking telescope. The SKA Organisation headquarters, located near to, and with views of the iconic Lovell Telescope at the University of Manchester’s Jodrell Bank Observatory in the UK, will be the central control hub for a global team who, over the next decade, will be building the SKA – the largest radio telescope ever seen on Earth. “The opening of the SKA headquarters at Jodrell Bank means that the world’s largest radio telescope now has a home in the UK – a major milestone for this truly inspirational international science project to explore the origin and evolution of the Universe”, said John Womersley, CEO of the Science and Technology Facilities Council (STFC) and Chairman of the SKA Organisation. The elegant and modern £3.34 million building, funded by the University of Manchester, is a state of the art facility which will eventually be home to upwards of 60 members of staff, including visiting scientists and engineers. Designed by architects Fielden Clegg Bradley and built by John Turner Construction Group, the building uses numerous environmentally friendly engineering solutions by Capita Symonds to ensure a minimal environmental impact. Natural lighting is provided by the huge glass facade, and the architectural teams have made important efforts to ensure that the ventilation, lighting and heating systems are as energy efficient as possible. 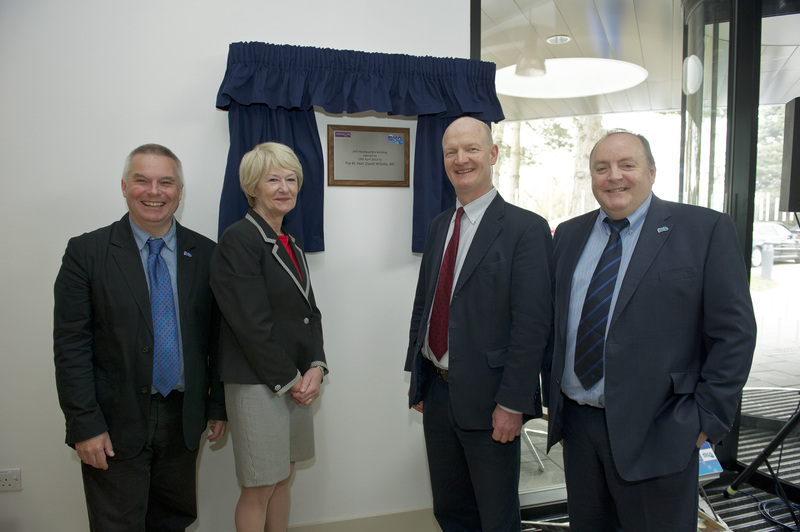 Built in just over 6 months, the SKA Organisation office has been in use since November 2012, when the team moved from the Alan Turing Building at the University of Manchester. The Square Kilometre Array is a radio telescope which will be built in the remote and radio quiet deserts of Australia and Southern Africa. These seemingly harsh locations have been carefully chosen for their remoteness from any possible man made radio interference. The SKA will comprise thousands of radio telescopes, which will be located in these two desert locations, and will also have dishes and antennas spread over thousands of kilometres to create a single giant telescope. When the faint radio waves, coming from the very edges of our Universe reach the array of radio telescopes, the signals are then combined, using powerful supercomputers which will create a virtual telescope with a total collecting area of one square kilometre. That’s one million square metres, or the equivalent of 140 football fields. This will make the SKA more than 50 times more sensitive than any existing radio telescope on Earth, surpassing even the resolution of the Hubble Space Telescope. The SKA telescope will be attempting to unravel the most profound mysteries of humanity and will revolutionise our understanding of the Universe. It will investigate how the first stars and galaxies formed after the big bang, how dark energy is accelerating the expansion of the Universe, the role of magnetism in the cosmos, the nature of gravity, and will even search for life beyond Earth. And scientists believe that the SKA’s unparalleled sensitivity and ability to image such huge portions of the sky at up to 10,000 times to the speed of current survey telescopes will produce detailed information and provide answers to many more fundamental questions about mysteries which are baffling scientists today. The project is led by the SKA Organisation, a not-for-profit company, which includes multiple countries around the world including Australia, Canada, China, Germany, Italy, Netherlands, New Zealand, South Africa, Sweden and the UK. With India also as an associate member, the SKA Organisation is expected to embrace more countries over the coming years. With such a formidable scale, international collaboration is fundamental to this gigantic 21st Century project. Construction of the SKA is due to begin in 2016 using a phased development approach. This means that scientific output will come even before the project completes and is fully operational in 2024, by which time several thousand combined radio telescopes will be collecting and processing data equivalent to 100 times today’s global internet traffic. However, even before the SKA comes online, a series of demonstrator telescopes and systems known as pathfinders and precursors, are already operational or under development across the world, paving the way for the kinds of technology which the SKA will need to pioneer to make the huge data available to scientists. These pathfinder and precursor telescopes, in place in Australia, South Africa, across Europe and in America are providing the SKA scientists with vital information relating to the science and technology that will be created and required to make the SKA work at its optimal performance capability. With so much being learnt from the pathfinders and precursor telescopes, the SKA project is now entering a hugely exciting phase. Research organisations around the world along with leading industrial partners have recently being invited to collaborate and submit proposals on the R&D and design of the telescopes and instrumentation which will become the heart of this epic endeavour. This first round of proposals are expected to be evaluated and assessed at the new SKA offices in July of this year. “We are now firmly on the journey to create one of the most iconic scientific instruments of the 21st Century!”, said Phil Diamond. From 2008 to 2011 inclusive the SKA Project Development Office (SPDO) and staff were based at the University of Manchester on the main campus. The SPDO Director was Prof. Richard Schilizzi. 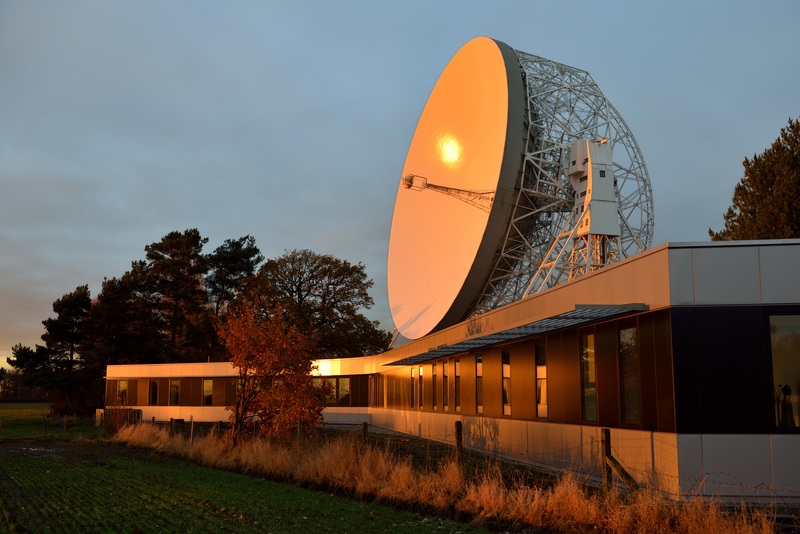 2 April 2011: UK Consortium including Universities of Cambridge, Oxford and Manchester, and the Science and Technology Facilities Research Council (STFC) win bid to house the SKA HQ at the University of Manchester’s Jodrell Bank Observatory. 14 December 2011: SKA Organisation is formed as a not-for-profit company limited by guarantee. 18 January 2012: First face-to-face meeting of the SKA Organisation Board. 18 April 2012: Ground Breaking Ceremony at JBO for the SKA HQ Building. 25 May 2012: Dual site (Australia and South Africa) agreement for the SKA Telescope made by the SKA Organisation. 5 September 2012: Prof. Philip Diamond appointed Director-General of SKA Organisation. The Square Kilometre Array will be the world’s largest and most sensitive radio telescope. The total collecting area will be approximately one square kilometre giving 50 times the sensitivity, and 10 000 times the survey speed, of the best current-day telescopes. The SKA will be built in Southern Africa and in Australia. Thousands of receptors will extend to distances of 3 000 km from the central regions. The SKA will address fundamental unanswered questions about our Universe including how the first stars and galaxies formed after the big bang, how dark energy is accelerating the expansion of the Universe, the role of magnetism in the cosmos, the nature of gravity, and the search for life beyond Earth. Construction of phase one of the SKA is scheduled to start in 2016. The SKA Organisation, with its headquarters at Jodrell Bank Observatory, near Manchester, UK, was established in December 2011 as a not-for-profit company in order to formalise relationships between the international partners and centralise the leadership of the project.